Credit: Kasper Steen Pedersen and We Love People. Graphene is the most well-known 2D material. Graphene consists of carbon atoms in a lattice structure, which yields it remarkable strength. 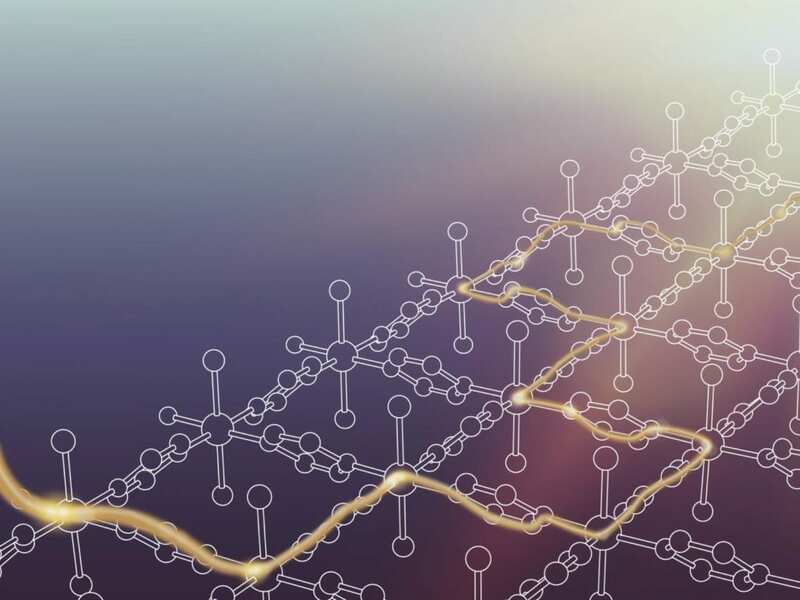 Since the first synthesis of graphene in 2004, hundreds of other 2D materials have been synthesized, some of which may be candidates for quantum electronics applications. However, the novel material is based on a very different concept. While the other candidates are all inorganic – just like graphene – Chromium-Chloride-Pyrazine is an organic/inorganic hybrid material. "The material marks a new type of chemistry, in which we are able to replace various building blocks in the material and thereby modify its physical and chemical properties. This can not be done in graphene. For example, one can't choose to replace half the carbon atoms in graphene with another kind of atoms. Our approach allows designing properties much more accurately than known in other 2D materials," Kasper Steen Pedersen explains. Besides the electrical properties, also the magnetic properties in Chromium-Chloride-Pyrazine can be accurately designed. This is especially relevant in relation to "spintronics". "While in normal electronics, only the charge of the electrons is utilized, also their spin – which is a quantum mechanical property – is used in spintronics. This is highly interesting for quantum computing applications. Therefore, development of nano-scale materials which are both conducting and magnetic is most relevant," Kasper Steen Pedersen notes. Still, companies are not keen to begin producing the material right away, the researcher stresses: "Not yet, at least! This is still fundamental research. Since we are suggesting a material synthesized from an entirely novel approach, a number of questions remain unanswered. For instance, we are not yet able to determine the degree of stability of the material in various applications. However, even if Chromium-Chloride-Pyrazine should for some reason prove unfit for the various possible applications, the new principles behind its synthesis will still be relevant. This is the door to a new world of more advanced 2D materials opening up."